How do I embed a publication in my site? How to protect publications and bookshelves? How do I distribute a bookshelf? For publications that have already been uploaded to FlippingBook Cloud, FlippingBook Publisher allows sharing via email. There are 2 ways to share your publications with your colleagues, clients and business-partners. We will describe them below. This way of sharing your publication is a preferable one. Paste the link in your email message. To open your publication on a specific page, go to that page and copy the full URL including the #pagenumber. For example https://flippingbook.cld.bz/htf-magazine#54 will open our example magazine (HTF) on page 54. If you are zoomed in, then the URL will change to include /z. For example if you send the following link: https://flippingbook.cld.bz/htf-magazine#54/z then it will open page 54 in zoomed mode. This way of sharing your publications is not the one we advise as it has the possible consequences. Note!If you use this option, your publication might go to Spam and, as the message will be sent from the email address noreply@flippingbook.com, the replies of your recipient will not be delivered. If you choose this method anyway, then please follow the instruction below. 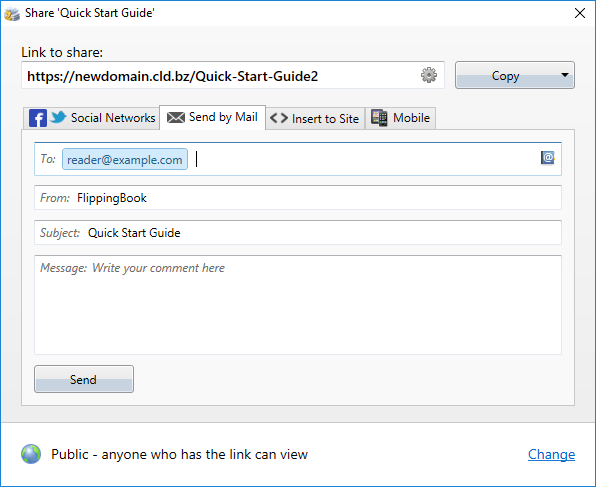 To create a newsletter in order to advertise a publication uploaded to FlippingBook Cloud, you can use the "Share" button in FlippingBook Cloud Manager. For regular sharing, you can also benefit from using the address book tool, which is plugged into this window. The address book is designed to store the contact details of colleagues, partners and clients. You can use these contacts repeatedly in order to share new publications via mailing lists. To open it, please, click on the “at” button of the Send by email tab. Click on the triangle of Add contact button. Choose Create New Contact to add the address manually or Import Contacts From to import your contacts from Outlook, Thunderbird, The Bat! or Gmail. Once you added your contacts put a tick next to the emails you want to send your publication to. Click on the button Use selected. Note!It will not be possible to send your publication to more than 20 contacts within one hour. After that, you can write the text to your recipients and click on the link Send under the text field. That is it, your publication has been shared with your contacts!